Canfab and Environmental Stewardship | Canfab Packaging Inc. Climate change is not a debate; it’s a reality. The rising sea levels, the number and severity of droughts, and the increase in violent weather phenomena are but a few of the signs that human presence on earth has not always been beneficial. David Suzuki, the well-known Canadian scientist and environmental activist, has been one of the major voices on the climate change issue for many decades and still believes that it is not too late for ordinary people and companies to start making a difference. At Canfab, we don’t believe in green marketing, we believe in green actions. All our products are generally made from recyclable materials, but most cities in North American currently do not have the necessary facilities to separate our cans into selective recyclable materials. So, for now, Canfab concentrates on what we can control to be a better corporate citizen and an environmentally conscious manufacturer. • Paperboard, one of the main components of our product, is made from 100% post-consumer and post-industrial reclaim. • The Electro Tin Plated Steel (ETPS) we use in punching our metal parts is made in part from 100% recycled steel. • When specified, our labels, which are mostly supplied by our customers, are printed using water-based inks and varnishes. • All our post-production waste, which consists mostly of paperboard and ETPS, is collected and resold to industrial recyclers. • One of our main production facilities runs on electricity generated exclusively from hydro power. 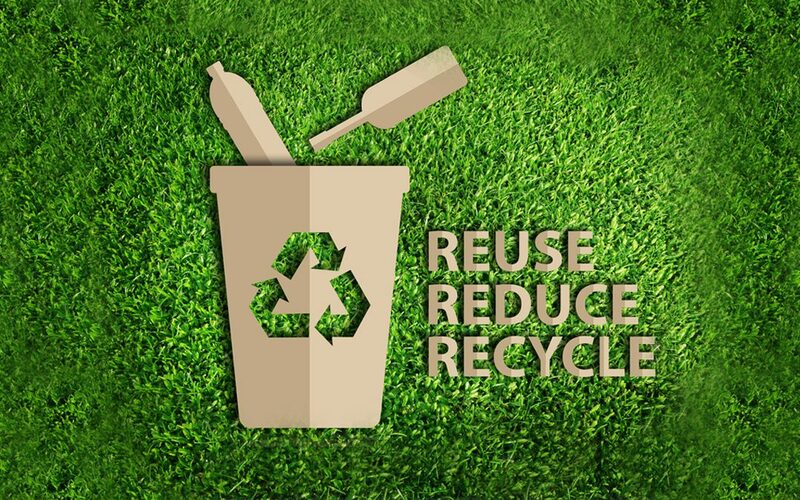 • All our employees participate in selective recycling and energy reduction programs that produce excellent results for the company and the planet. • Because of the light weight and stacking advantages of our products, we always strive to optimise both occupied space and load weight during the transportation process. • All lighting at our facilities have been changed to use electronic ballasts, significantly reducing energy consumption. • New air compressors were also installed in our plants, further reducing energy consumption. • Canfab has received the Gold Status Award for one of its production facilities from the “Here We Recycle Program,” managed by Recyc-Quebec. • For other concrete examples of our engagement towards sustainable manufacturing, consult our “Recycled Materials Program” available upon request. The future is clear…and clean. No company can claim to have a perfect track record when it comes to operating a business in a sustainable manner, but we don’t have the choice to not try. In all recorded history, it is in the last 150 years that humans have caused the most harm to the planet’s ecosystem. Working in harmony with nature is not only good for a company’s image, it’s a must to protect the generations that follow. The antiquated way of thinking that more environmentally sound business practices equate to decreased profits is over. In 2017, we now have the know-how and technology to do both. So, don’t just think green – DO GREEN.